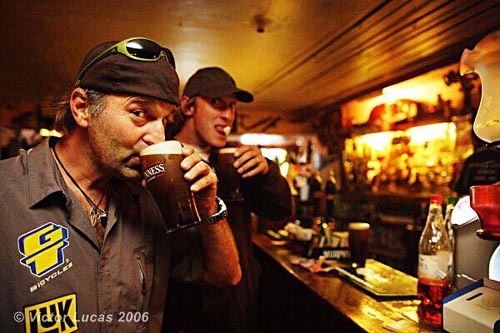 “That’s it, I had enough, I can’t stand anymore pubs for at least a month or lets say a week”, after spending the last 6 days in an RV camper together with the current Downhill World Cup Champion Steve Peat and Irish photographer Victor Lucas. 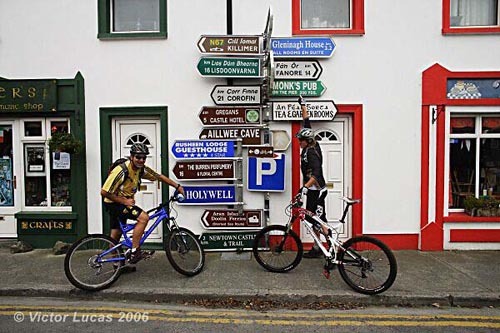 Our mission was to hit some of Irelands best biking spots, while visiting as many pubs as possible along the way. The camper was packed with several bikes from each of us. I brought my GT i-drive 7 and GT i-drive 5 bikes as well as my Trials bike, Peaty brought his V10 DH bike and his Santa Cruz Nomad freerider. Our first stop was the Guinness Brewery and a little urban asult through the streets of Dublin, before we hit the road to head west towards Croagh Patrick, a famous pilgrimage mountain on the west coast of Ireland. Once we finally arrived on the other side of the country on the narrow winding roads, we had managed to stop at 7 pubs, including Sean’s Pub, the oldest one in Ireland dating from the 1600’s. At this point I have to confirm the rumors that the creamy dark Guinness beer does indeed taste better in Ireland. We got a slow start the next morning, not so much due to hangovers, than the misty and moist weather. Even though we had to first carry and push our bikes for 2 hours uphill, we decided to bring the heavy artillery – the big bikes. Saint Patrick’s mountain proofed to be quite a challenge, the weather was foggy and rainy, often we had a visibility of less than 20feet, until we eventually reached the small church on top of the mountain. It was windy and cold, tradition has it that pilgrims have to run 15 times around the church to get rid of their sins, we didn’t even bother to ride the 15 laps. 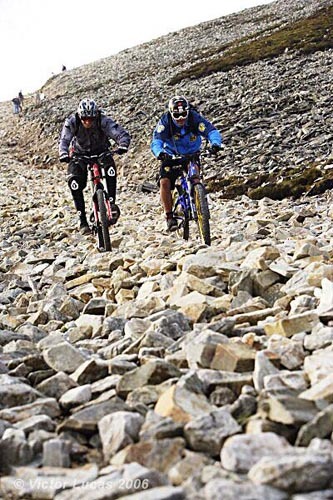 The downhill was superb – big loose stones and steep slopes. Shortly after we left the summit the sun started to peak through the clouds and opened up a breathtaking view below us. 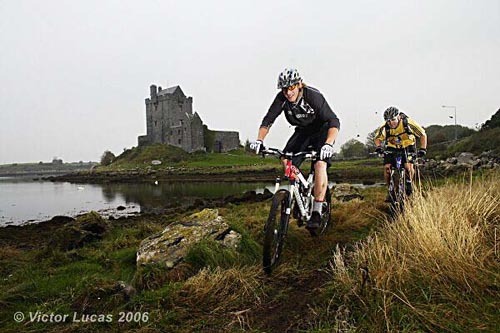 The lush landscape and coastline was eye-candy, just as it was to watch Peaty skip over the loose rocks at high speed. It was a fun ride down, the trail offered many different lines, which kept it really fun and interesting. 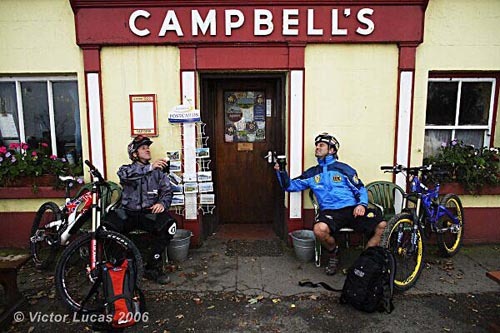 Campell’s Pub was a good call and the beer tasted even better after we had to earn it hard. Peaty wasn’t in the mood to skip many pubs, his mission was to hit at least 30 different pubs during our 6 day trip, and half pints weren’t an option either. 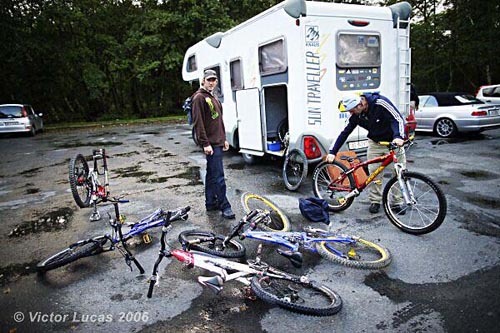 That night we parked the RV at a local mountain bikers house and took it easy. 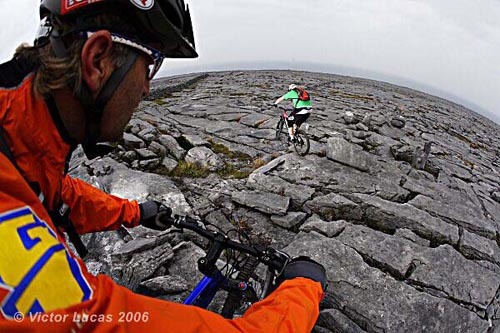 Our next stop was the Burren, a vast rocky landscape, with little vegetation and miles of cracked rock slaps, which were actually quite fun and challenging to ride. 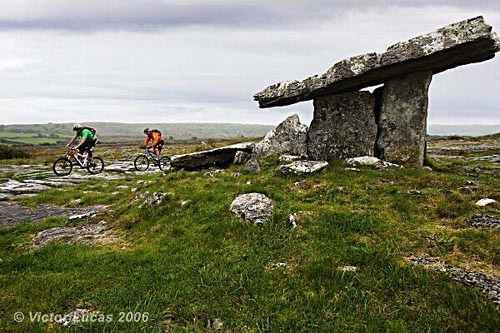 We rode parts of the Burren Way, an old historic route and popular hiking trail. Medieval castles and 5000 year old dolmen and stone circles marked the way, the weather wasn’t great, but at least it didn’t rain; yet. It was good to get out of the RV and spin our legs through this remote countryside. In the late afternoon we arrived at the Cliffs of Moher, which were for me the main reason why I wanted to come to Ireland. 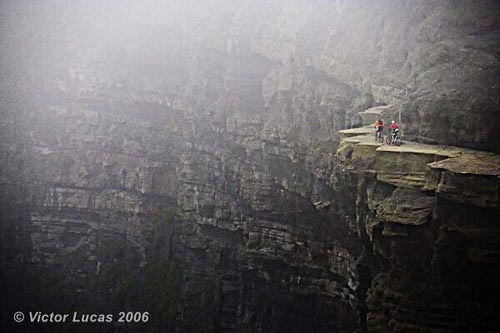 The 600 feet tall cliffs are entirely vertical and the edge is very abrupt. 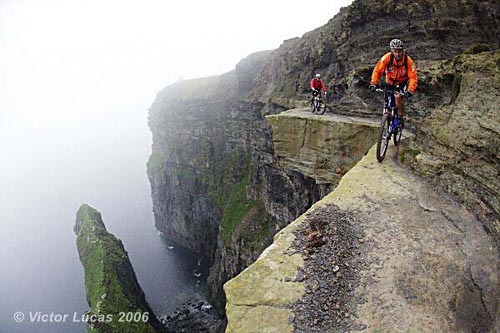 My dream was to ride along the small narrow ledge that was between 6 feet to 6 inches wide and looked like a long curvy balcony without a handrail. 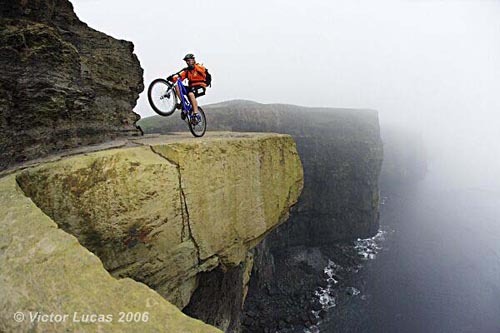 Upon arrival at the Cliffs we had to postpone those plans rapidly. The weather was getting worse and herds of tourists were all over the place, plus the security guy wouldn’t let anybody near the edge of the cliffs. We changed our plans and did a pub crawl instead, hoping for better conditions and luck in the early morning, before anybody else would get there. It turned out to be my favorite pub experience of the trip. In the small seaside village of Liscannor we found 4 pubs next door to each other. Five Pints of Guinness later and after a great seafood dinner and some fresh oysters it was time to hit the second pub, after a quick drink to quench our thirst, we moved one door over to Egans Pub, where locals were playing Irish folk music and the old fireplace was keeping us warm. We were told earlier, that with a bit of luck, “T. 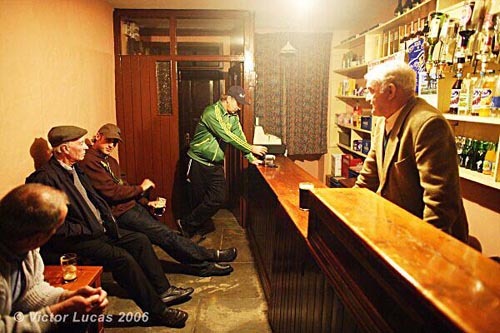 O’Brien” pub would open at around 11pm, sure enough the doors were open and 3 characters, straight out of the 50ties, were sipping on some drinks. It was like being set back in time, this place has been around for a long time, but it must have been at least 50 years, since any of the interior, including the suit and tie of the bartender have changed. Locals warned us of the upward drafts, that blow people off the cliffs – and sure enough the wind was picking up over night. We got an early start, and even the extra strong italian coffee I brewed couldn’t clear our heads. 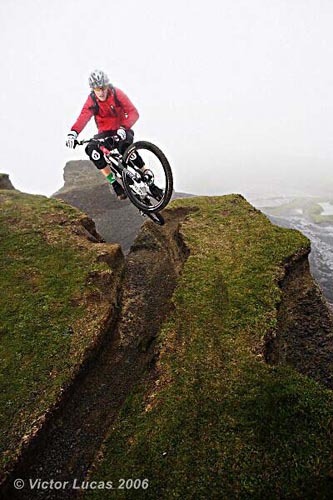 Even though the conditions and weather were less than good, this was our one and only chance to ride the cliffs, so we did. It was a rad feeling to ride along the exposed edges and jump over some of the gaps. As time went on we started to feel more and more comfortable and daring. Shortly after we got done it started pouring rain, nonetheless we continued the trail on top of the cliffs, which was one of the more spectacular trails I have ridden. We followed it all the way to Hag’s Head. From there we drove to RV to County Kerry in the South of Ireland. Our next stop was the beautiful town of Killarney and Ross Castle. 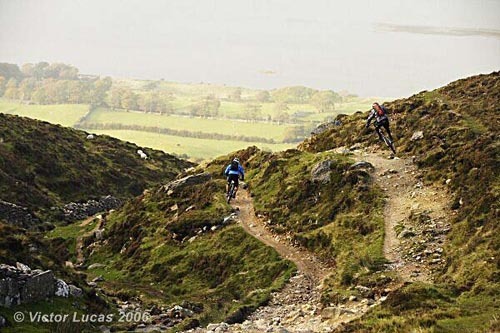 The following day we did a killer XC ride on the Old Kenmare Road, another classic hiking trek. We were joined and guided by Rory, a local mountain biker. 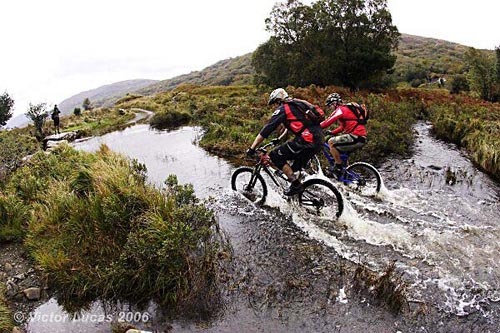 Once again, the riding was better then I expected, the trail was about 20 miles long and had all sorts of elements we had to tackle, some good uphill sections, water-crossings and muddy sections as well as very slippery rocky sections which required trials skills. 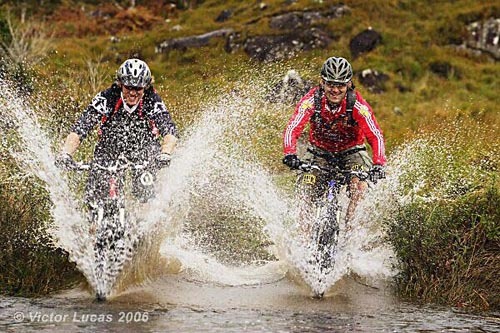 Peaty and I challenged each other for little “ride-off’s”, to see who could make it further. Some sections we tried over and over again, until one or both of us would make it. 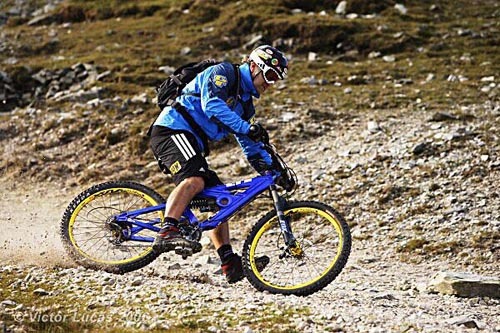 It was interesting to compare our different styles, Peaty convinced me that speed can be a good friend, even when its super rough and technical, as long one has the skills and cajones. 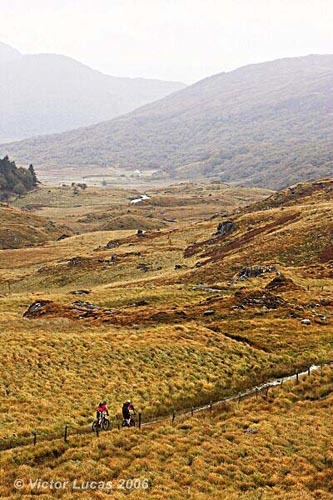 The landscape kept changing, sometimes it looked like the Scottish Highlands, then it was moss covered forests or northshore style trails which led us on railroad beams across the swampy areas. We arrived completely soaked at the RV. 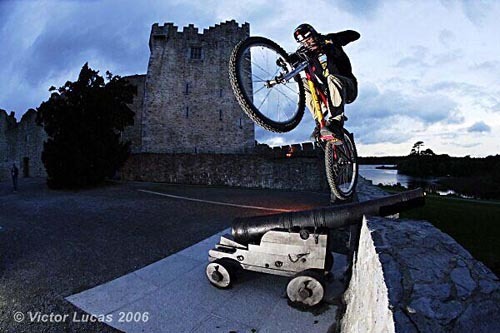 The rest of the time we spent pursuing Peaty’s 30 Pub goal, with stops in Kenmare, Cork and last but not least Dublin, where we were joined by a bunch of the local riders and I gave a little trials demo in one of the pubs. 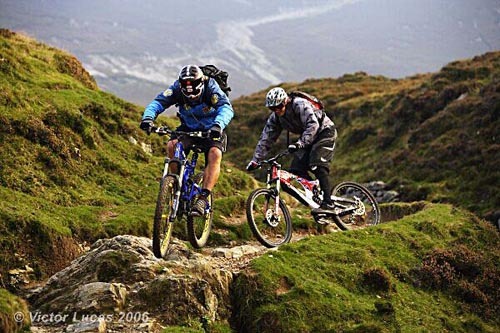 31 pubs, excellent trails and good memories. We boarded the ferry to the UK the next morning.